Offered with 05.32 release (INYO) is an expanded memory option on the VNX7500 model. This larger memory option allows for a memory upgrade from 24Gig to 48Gig per Service Processor. As with all VNX models there will be a certain amount of memory used for the FAST suite. The amount of memory consumed by FAST suite differs for each system. 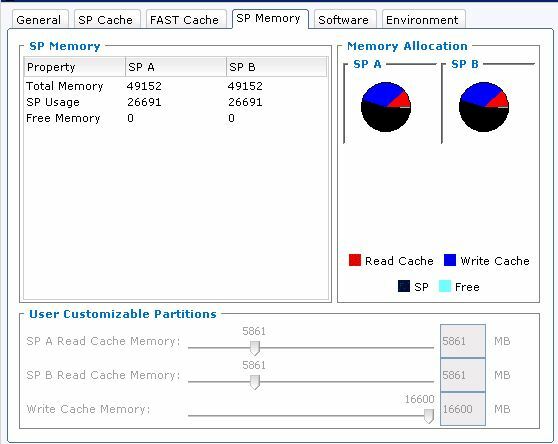 There is a certain breakdown of memory usage within the FAST suite itself with Data services (FAST VP, Thin & Compression enablers) using a predefined amount of cache and FAST Cache using approx. ~1.6MB of DRAM per usable GB of FAST Cache. The maximum write cache available on the 48GB model is 16.6GB whereas with the 24GB model this wc/max is 14.25GB. But the point to note is on the 48GB model the wc/max is not affected by FAST suite whereas the 24GB model with all FAST Suite enablers installed and with FAST cache to the maximum usage the wc/max could potentially drop to ~7.5GB. This is all relative and depends entirely on your workload. This example has the data service enablers installed and 916GB of FAST cache (10 x 200GB). The following configuration example will use the full wc/max of 16.6 and the remaining available cache (This depends on data services and FC usage as described above) will be assigned to read cache. Please be cautious about making these changes in production environments as performance will be affected. 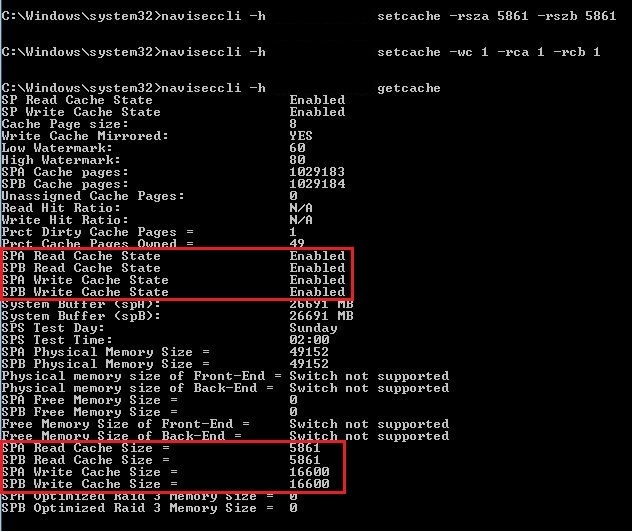 Note that write cache is system wide and mirrored across SP’s.